In this section, we are going to learn about Concentric circles. Already we are familiar with Circles. When a small stone was dropped in still water, you might have seen circular ripples were formed. Which is the center of these circles ? Is it not the place where the stone was dropped ? The circles with different measures of radii and with the same center are called concentric-circles. The center is known as common center. Circles drawn in a plane with a common center and different radii are called concentric-circles. See the figure given below. The above figure represents two concentric-circles. In the above figure, the area between the two concentric -circles are shaded with red color. The red colored area is known as circular ring. 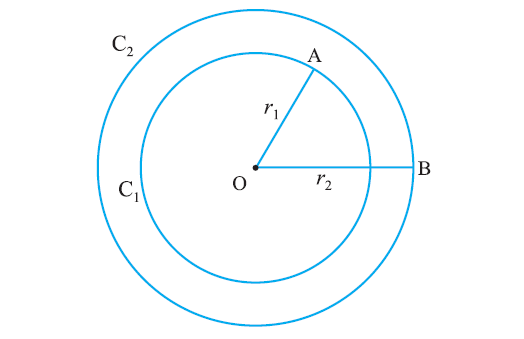 In the figure given above, C₁ and C₂ are two circles having the same center O with different radii r₁ and r₂ respectively. Circles C₁ and C₂ are called concentric-circles. The area bounded between the two circles is known as circular ring. Draw concentric-circles with radii 3 cm and 5 cm and shade the circular ring. Given: The radii are 3 cm and 5 cm. Draw a rough diagram and mark the given measurements. Take any point O and mark it as the center. With O as center and draw a circle of radius OB = 5 cm. Thus the concentric-circles C₁ and C₂ are drawn. 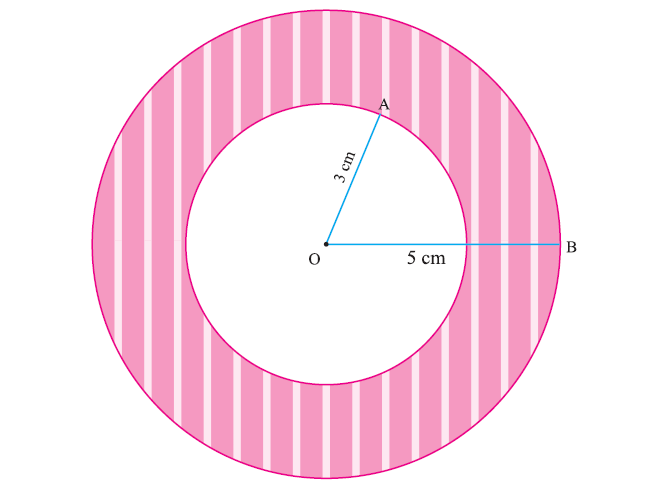 Width of the circular ring = 2 cm. After having gone through the stuff given above, we hope that the students would have understood "Concentric-circles".